Do you have an issue that’s bugging you? Tired of THINKING about it? Need a new way to look at something? Need to make a decision about something? Want a creative way to gain insight into what’s going on in your life right now? Here’s an example of one I did for an issue that’s been bugging me for a while. Every time I come close to succeeding at something, I seem to self-sabotage my progress. Quite frankly, I’m tired of it. Of late, I’ve been reading Gay Hendricks’ book “A Big Leap” where he talks about how to conquer our hidden fears…in particular pushing past our upper limit fear so that we can take a big leap towards reaching our full potential. 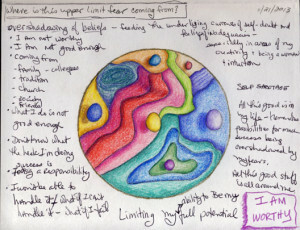 Here’s the intention I set for this mandala: where is this upper limit fear coming from? When I finished it, I realized that I have a lot of good things going on in my life and yet I let some outdated beliefs overshadow my efforts. At the same time I have these underlying issues of self doubt and feelings of inadequacy. draw, doodle, scribble, color, paint, collage whatever pops in your head WITHOUT JUDGEMENT …let ‘er rip! 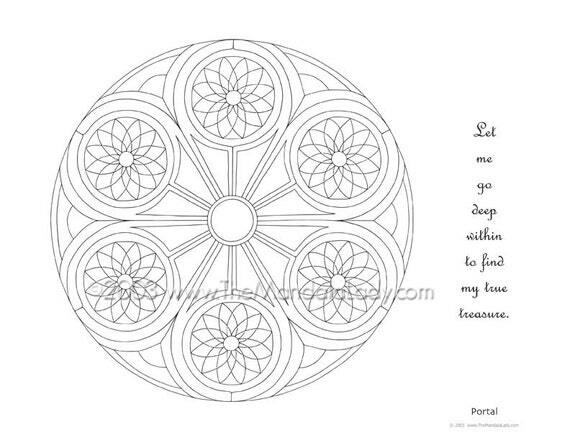 when done creating the mandala, explore all angles of it…what does it look like to you? what does it feel like? if you had to make a guess, what is it’s message to you? let go of thinking this is an art project…it’s really about connecting with our inner creative self, our intuition, and expressing what we experience in a creative way…if it looks ascetically pleasing to you in the end, then hooray…icing on the cake!